Did you hear the buzz? Bees are totally the rage this Halloween! They are cute, fuzzy, and make sure all of our trees and plants grow properly. Cute and functional? We can see why everyone is talking about bees this season! But you know what’s really the bee’s knees (sorry not sorry for all of the bee puns)? The people who keep the bees under control and doing their jobs. The bee keeper, of course! After all, we can’t just have beens flying around all willy nilly, can we? So if bees are the hottest thing since honey from a jar, then the beekeeper is at the top of the heap! 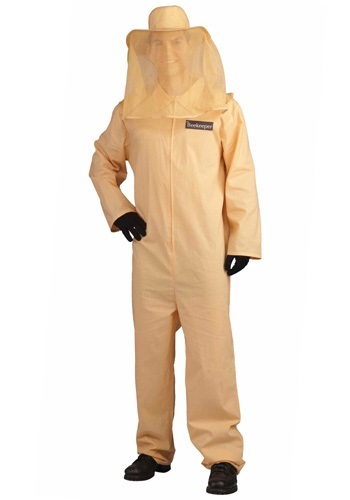 You'll "bee" very popular in this Adult Bee Keeper Costume. Make sure that all the bumble bees, honey bees, and yellow jackets pollinate correctly. This costume especially looks cute when you have a bunch of honey bees with you. Have all your buddies dressed up in bee suits and you can lead the gang! This polyester and cotton bee keeper costume comes with everything you need to tend to your hypothetical bees this Halloween. The manila jumpsuit zips up in the front for a comfortable fit as well as easy on and off all night long. The name tag on the jumpsuit reads “The Beekeeper” and is placed on the upper left of the suit. No one will mistake your profession this Halloween! The matching brim hat with attached netting completes the beekeeper look and will have you ready to head into the hive for any occasion.